10:00 a.m. - 4:00 p.m., last appointment at 3:15. Contemporary. Innovative. Out of the Ordinary. All of the wines in the Paraduxx portfolio are made in a state-of-the art winery that was unveiled in 2005. The centerpiece of the Paraduxx winery is a unique 10-sided fermentation building inspired by traditional round barns. Flanking the fermentation building are two symmetrical barrel cellars, partially set below grade to allow gravity flow of the fermented wine to oak barrels for aging. The luxuriously appointed Paraduxx Vineyard House welcomes guests for an array of intimate sit-down tasting experiences. 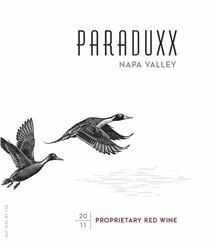 Paraduxx winery is located in the center of the Napa Valley along the less traveled Silverado Trail. The architectural innovation of the estate is a unique ten-sided fermentation building, which houses a contemporary winemaking facility. We are pleased to welcome guests to the Paraduxx Vineyard House for by-appointment daily tastings. Our enticing tasting options include our Enhanced Tasting ($30), which allows guests to explore some of our most sought-after library and limited-production bottlings. These tastings are offered in a contemporary setting, and feature tableside service, modern stemless Riedel 'O' glassware, and cheese complements-an ideal way to experience Paraduxx's rich, food-friendly blends. To join the wine club, visit www.paraduxx.com or call 707-945-0890. •Preferred access to our world-class current release, library and large format wines. •Use of our private members-only areas including gardens and barrel rooms. •Access to winery properties to host a private wine-focused event once per year, at special pricing, for up to 12 guests. •Invitations and special pricing for exclusive events and elevated tasting experiences at the winery. •Discounts on re-orders and expedited shipping included. •With prior appointment, complimentary tastings for up to four guests, with member present. 2 for 1 tasting, up to 4 guests. Reservations required.